Closing the Bones is a postpartum healing ceremony, created by a Mexican tradition where the postpartum mother is anointed, massaged and wrapped. It helps to nurture the mother after her birth journey into motherhood. It is a celebration, a setting of sacred space, and a way to nurture mother and baby. The closing the bones ceremony itself is about helping the mother to return physically and energetically back to herself through the use of a deep abdominal massage around the pelvic area with lots of ‘sifting’ with the use of the Mexican rebozo shawl. The use of the rebozo when sifting encourages lymph drainage, blood flow and the energy channels within the woman’s body to open and restore themselves to allow her to restore her own energy levels. This knowledge was passed onto the doula community by Dr Rocio Alarcon (originally from Ecuador) who is a traditional midwife and trained in shamanism and ethnobotany by her mother and grandmother. To begin, I start with ‘sifting’, using a rebozo on specific areas of the your abdomen and hips. The sensation of the energy flow once this is done is immense. I then begin to gently massage the abdomen, lower back and hips, which encourage the internal organs such as the bladder and uterus back into their right place and to draw your energy back to the centre of your body. Your baby can stay with you at all times. The rebozo is used throughout to gently sift the pelvis and body to encourage the bones to realign. During the massage you may experience a huge release of emotions relating to major life events or to the birth experience itself – it is very deep and moving on a spiritual, physical and emotional level. 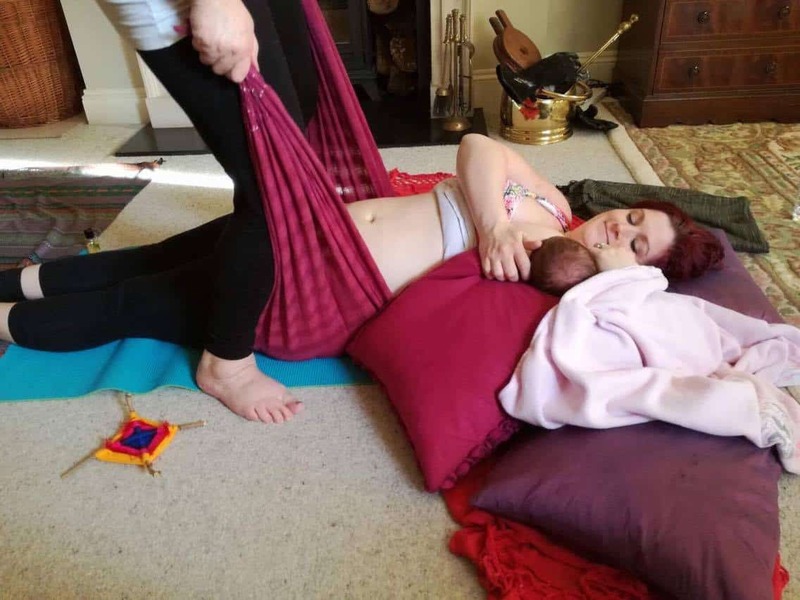 Once the massage is complete the rebozo’s are used to gently wrap your head, shoulders, hips, knees and feet – each part of your birthing body is honoured. This ritual can help to “close” a new mother energetically, as pregnancy, and the intense process of labor and birth, can be a very vulnerable time for a woman, psychologically and psychically. The ceremony can be performed very soon after birth (dependent on the type of birth – usually 6 week after caesarean section). Traditionally this ritual is carried out 1 – 5 times within the first 40 days postpartum, but it is also beneficial for women to receive this as a single session. I was honoured to be able to receive this myself more than 30 years after giving birth to my own children – it’s never too early or to late to benefit! “Once I was wrapped in the Rebozos, I had a sense of being ‘knitted’ back together”. Sherri Smith, January 2017. The ‘closing the bones’ massage is offered in the comfort of your home. Each session costs £60.00.